For an Ember Inn, having to wait nearly an hour for food on a midweek evening from 6.30 is completely unacceptable. What we then got was mediocre at best. Word of advice - if you want the flat bread pizza, order from the children's menu where its advertised as a kid's pizza.. It's exactly the same & two pounds cheaper!! And you get a pudding!! Beer range looked reasonable at first, but most were not ready. Used this pub as my local in the early 1980s, how things have changed!! Hi, I am possibly the longest surviving regular at The Queen Adelaide I am now 66 and started going when I was......well just lets say younger than I should have been! As you can imagine I have seen many changes over the years. New managers, new bar staff, new kitchen staff and numerous re-vamps. 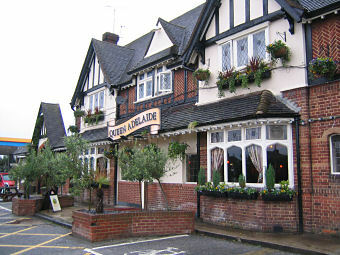 What has never changed is the great atmosphere, it's still a warm friendly pub with friendly staff and a great carvery. I now have children and grandchildren who eat there most Sundays and I still pop in two or three times a week for a beer with my mates and the odd meal. The food is great...a full carvery Mon-Fri � 5.95!! you can't really beat that...give it a try. If you see an old guy at the bar know as 'JC' you can always buy me a beer! we fancied a carvery and popped into this place about 2pm on a Sunday. The staff were great and we got seated straight away, and very fast with the drinks.